July 26, 2017 – The Synod of the Ukrainian Orthodox Church met for its regular session at the Kiev Laura of the Caves. It was chaired by His Beatitude Onufry, Metropolitan of Kiev and All Ukraine. In connection with ‘numerous appeals of the faithful’, it was resolved that the Synod should address Ukrainian President P. Poroshenko, Prime Minister V. Groysman and Supreme Rada Speaker A. Parubiy concerning biometrical passports. Blessing was given upon the holding of church-wide celebrations on the occasion of the centenary of the martyrdom of the Holy Martyr Vladimir, Metropolitan of Kiev. Metropolitan Pavel of Vyshgorod and Chernobyl was instructed to submit to His Beatitude the membership of the Organizing Committee and a plan of events. 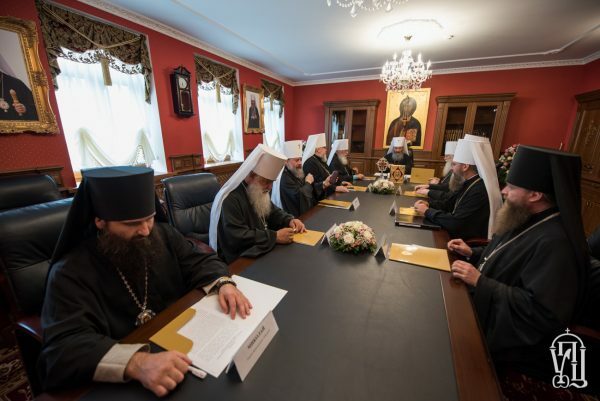 It was decided to introduce amendments to and register reviewed statutes of the Synodal Departments (missions), diocesan administrations, educational institutions, monasteries and brotherhoods as required by the Ukrainian Internal Revenue Code relative to non-profit organizations. In connection with captures of the UOC churches, it was resolved that concern and gratitude be expressed to the clergy and laity ‘for their faithfulness, feat of confession and steadfastness in preserving canonical Orthodoxy’. The UOC Synodal Department for Social and Humanitarian Issues was instructed to begin, together with the Favor Foundation, a charity program ‘A Drop of Peace’ to raise funds for the construction of churches in settlements in which churches have been captured. All the faithful of the Ukrainian Orthodox Church were called to take part in the charity program. The Synod also made several decisions concerning the ordering of internal life of dioceses and monasteries and established new dates for the celebration of Synaxes of Locally Venerated Saints.